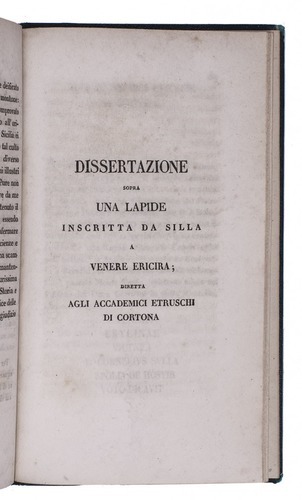 Dissertazioni risguardanti il culto di Venere Ericina. Turin, widow Pomba and sons, 1824. 8vo. Green half morocco, gold-tooled spine, with the arms of Joaquín Gómez de la Cortina (1808-1868) in gold on each board. 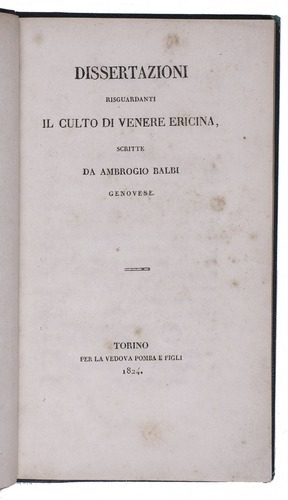 Two interesting dissertations by Ambrogio Balbi on the Venere Ericina (Venus of Eryx), a cult of Venus originating on Sicily. The second was published before in 1807, but the first appears here for the first time. 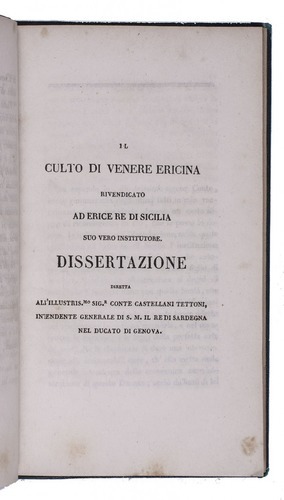 The opening dissertation describes the Sicilian origins of the cult, the second one deals with an inscribed memorial stone originating from the Sicilian sanctuary at Monte Erice. 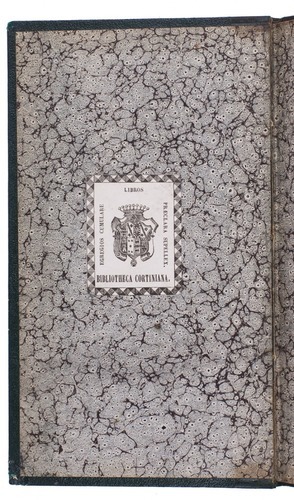 From the collection of Joachim Gomez de la Cortina, Marqués de Morante (1808-1868), a Spanish senator and rector of the University of Madrid, one of the leading bibliophiles of his day. His library was sold at Paris in 1872. Some spots on the first few leaves and the spine slightly rubbed, but otherwise in very good condition. Cat. de la bibl. 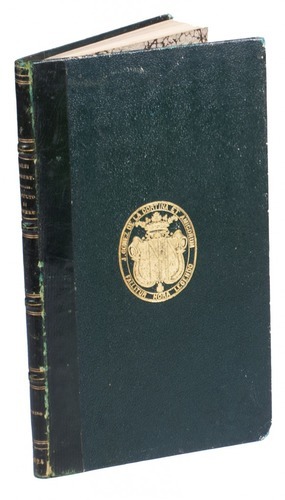 de feu M. le marquis de Morante III (1872), 3588 (this copy); ICCU 002765 (3 copies); WorldCat (7 copies).